Your physician will schedule your admission to the hospital. With non-emergency admissions, you should call at least five days before the day of admission to pre-register and verify your address, phone number and insurance information. Pre-registration may be reached at 951-736-4826. The information you provide will be forwarded to one of our financial counselors, who will call your insurance company in order to verify eligibility and receive authorization for your admission. 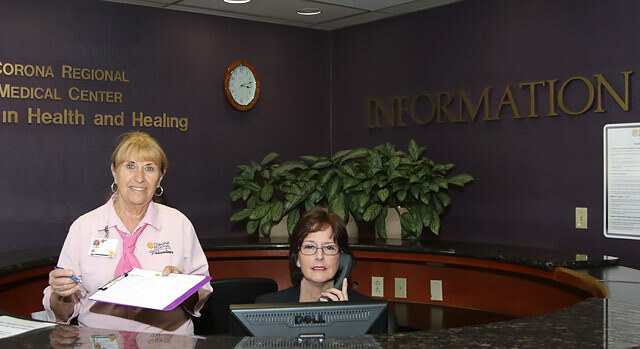 If you have a co-payment due, our Insurance Verification staff will contact you. You will be asked to make a payment via our online patient payment portal, via credit card over the phone, or on the day of admission. You will still need to sign your admission forms when you come to the hospital to complete your registration. On the day of admission, please check in at the Concierge Desk in the Main Lobby of the hospital. From there, you will be directed to the appropriate department. Our online Winter 2019 Patient Handbook contains everything you need to know about your stay at Corona Regional Medical Center. Download the Handbook to find out detailed patient information about Corona Regional's Main Campus, Magnolia Campus, Home Hospice and Health and more. If you are scheduled for an outpatient surgery procedure, you will be requested to preregister, which will include your preoperative testing. You may also be scheduled to meet with the admissions nurse at that time. If you are not scheduled for a preoperative appointment you will receive a call from an outpatient surgery nurse regarding what you need to do to prepare for surgery. Please do not bring jewelry, valuables, movies, electrical appliances, medications or unnecessary cash.